This blog entry about the events of Monday, April 26, 2010 was originally posted on April 28, 2010. Her name was Juju, and she would be one of my two hosts during my second trip to China — this time based in Shanghai, northern China’s glamourous, dynamic showcase city of international modernity. An important world port city since the 19th century, Shanghai has had a long history of prosperity and commerce from its former days as one of the busiest ports in Asia — whose security was defended over the years by the British, French, Chinese, Japanese and Americans — to today, where it stands as a glitzy, ultramodern metropolis of skyscraping glass and metal. It is quintessentially an international city of world cuisine, business, and culture, which doesn’t forget to nod its head to its Chinese ancestry — that is, whenever it gets a chance to breathe from its fast-paced lifestyle. Shanghai’s international status has earned it the honor of hosting the 2010 World Expo, which would start within the duration of my stay — not that that was the impetus for my visit. However, it was the new hi-speed Maglev train (short for magnetic levitation) which was constructed for the Expo, that zipped Juju and me from the airport to the city at over 300 km/hr in no time. The businessman on my left got a kick out of the speedometer as well, and he took a photo too. We shared a laugh. “Scott is very alone,” Juju told me, using the English vocabulary she knew. “It’s just us now.” Life as an ex-pat has its ups and downs, even in an international albeit transient city like Shanghai. Due to personnel restructuring and other business factors, Scott’s circle of ex-pat guy friends (some with Chinese girlfriends) had left Shanghai, leaving him to be with Juju and his job, working in the office of a factory of automotive materials and insulators. Not that that was a bad thing — especially in the American automotive business climate these days — for good things are spawned from within boundaries. Plus, I felt that my visit would bring a welcome new face to shake up their regular routine, if only for a short while. “We love having company!” Juju told me as the countryside zipped by at 187 miles per hour. We were greeted by Haibao, the funny-looking, almost-Gumby mascot for the Shanghai World Expo littered all over the city, and hopped in a taxi from there. 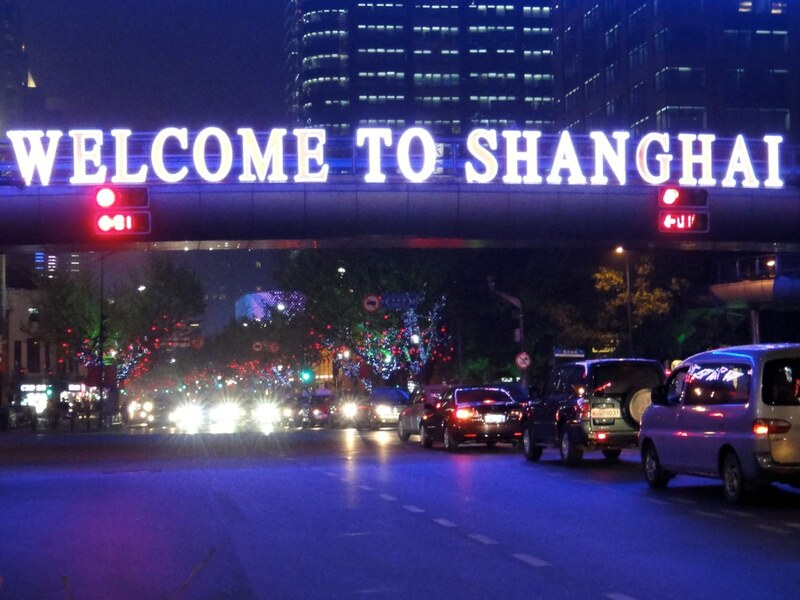 My first impressions of Shanghai that it was unlike my former image of a crowded China. Like Taipei, it was “like China but with better urban planning,” which made perfect sense; most of what modern Shanghai is today was only built since the early 1990s — The Simpsons was already on television before the Shanghai skyline was even built. Oh, the things you can build when you’re not busy doing the Bartman. Roads were wide, traffic wasn’t crazy (at least by New York standards), and people walked their dogs at a leisurely pace. And once we arrived on the 16th floor of Scott and Juju’s hi-rise apartment in the lively downtown Pudong district, I saw another dog scurrying at a leisurely pace: their 3-month-old pup named Qiuqiu (translates to “ball”), who took a fondness to me immediately. Juju extended her Chinese hospitality — shoes off, slippers on — and showed me around their spacious three-bedroom apartment with a view. We chat over coffee until the man of the house opened the door from a day at work. “There’s the legend,” he greeted me. I hadn’t seen Scott in person since his visit to New York during a BootsnAll travelers’ meet-up in 2005. Since then, he’d jumped on the opporunity to transfer from Michigan to Shanghai “for a year,” only to extend his stay indefinitely. SICHUAN CITIZEN WAS A SWANKY 1930s RETRO JOINT, a place where Lao Che or Willie Scott of Indiana Jones and the Temple of Doom might have frequented. (Both the mention or movie reference absent from the Lonely Planet guide.) “How often do you come here?” I asked over my first beer. First impressions were spicy, with plenty of red chili peppers heating up each of the Sichuan-style dishes: sliced jellyfish in vinegar, Sichuan chicken (which wasn’t as spicy as the one in Hong Kong), a stew of noodles with congealed chicken and duck blood, and spicy skewered prawns — all of which had pictures on the menu, so you could just point to them. As spicy as it was, it didn’t stop me from stuffing my face. “I want ice cream,” Juju suggested to cool off our mouths. We went to the obvious place for a quick cone of soft serve. “Bet you didn’t think you’d be coming in here,” Scott joked. The cashier with the fashionable “I’m lovin’ Shanghai” shirt rang us up, next to a sign promoting McDonald’s new pork sandwich. THE CHINESE GOVERNMENT HAS BEEN “LOVIN’ SHANGHAI” since they decided to build it into one of their world-class showcase cities. While there was already the Cantonese metropolis of Hong Kong in the south, it was mostly developed under British control and only handed back to China in 1997. To prove to the world that China could develop a rival Mandarin city in the north all on its own, modern Shanghai was born. And what a rival city it is. I commented that Shanghai is like Taipei in that it’s “China but with better urban planning,” but it is far grander than Taiwan’s capital, or even its Cantonese sibling. “Ha, the Chinglish here has come a long way,” Scott said. It was a school night so we packed things up relatively early, and head back to the apartment. Scott reiterated what Juju had told me before, how nights out hadn’t been as crazy as when his ex-pat friends were around. I was happy to be of some entertainment, but even happier for his invitation for me to stay with him and Juju, to see and explore the great city of Shanghai. “How’s the crime here?” I asked my host. So is it true, Dr. Jones? You found Nurhachi? Lovin’ the Tron reference! Hadn’t thought about that one before. Looks like I need to go visit Shanghai! Do you notice anything different from behind the great firewall? NOELLE: Hot during a sunny day; chilly at night. Take notice of my wardrobe in the next entry. MARKYT: That Nurhachi’s a real, small guy.